Crews inspect the sinkhole near the corner of Cesar Chavez and Sabine Streets. Update: Cesar Chavez Street is now open to eastbound traffic, but one westbound lane is still closed as crews finish work on a sinkhole found this morning. The cement used to fill the hole has very little water and dries quickly, but is not expected to be fully dry until after rush hour. Original post (12:17 p.m.): Westbound Cesar Chavez Street is closed from I-35 to Red River after a sinkhole formed near Sabine Street. The hole is only a little more than a foot wide on the surface, but Austin Police Corporal David Boyd said the external size of the sinkhole is deceiving. “The city’s bridge department has looked underneath and is saying it’s probably about 15 ft by 15 ft wide – underneath,” said Boyd. Crews are peeling off the asphalt to determine the best way to fill up the hole. Westbound Cesar Chavez will be closed in the area through rush hour today and possibly through Saturday. 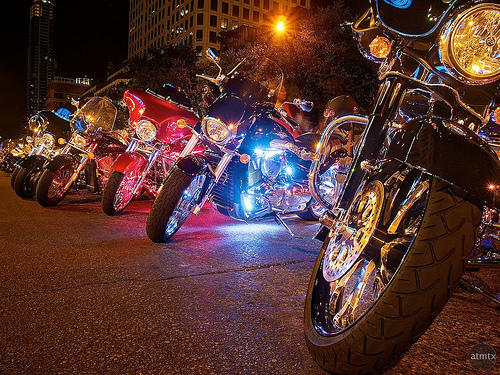 The City of Austin says the closure won’t affect the Republic of Texas Biker Rally Parade. But closures for that will begin around 5:30. Drivers trying to get downtown after that are best off using streets north of 11th. The Republic of Texas (ROT) Motorcycle Rally comes to Austin for the 18th time this weekend. It kicks off Thursday morning at the Travis County Expo Center and runs until noon on Sunday. Several roads close early Friday evening for the event, including Congress Avenue between East 11th Street and Cesar Chavez Street. The ROT Rally Parade will also close roads from the Travis County Expo Center to downtown, beginning around 8 p.m. Friday.